That was the question I needed to ask myself. Is there a need for yet another Catholic voice out in the blogosphere? Do I have anything to contribute to the current dialogue that would hopefully be relevant and constructive? What I do have is a wonderful and supportive wife who felt that I had something worth saying and who encouraged me to undertake this journey. So, why call my blog Liturgy Guy: Life, Liturgy and the Pursuit of Holiness? I was blessed to receive the Sacrament of Confirmation and enter the Catholic Church back in 2006. Since then I have sought to continuously learn more and more about the Church. During my journey I have had the opportunity to meet and learn from many knowledgeable and faithful Catholics who have helped me to continuously grow in the Faith. I have also been blessed with a very holy and traditional pastor during this time who always challenges his flock to pursue holiness through living a life in total fidelity to Holy Mother Church. Several years ago I first heard the Latin expression, “lex orandi, lex credendi” which translates to the “law of prayer is the law of belief”. To paraphrase, how we worship is how we believe. Added to this sometimes is “lex vivendi” which completes the thought: how we pray is how we believe which is how we live. We know from St. Matthew’s Gospel that our Lord teaches us, “You shall love the Lord your God with all your heart, and with all your soul, and with all your mind. This is the great and first commandment”. The supreme prayer of the Church is the Holy Sacrifice of the Mass. Indeed, the Eucharist is the “source and the summit” of our life. Over the years since entering the Catholic Church I have continued to grow in my love of the Holy Mass. The Mass is the liturgical prayer of the Church. Defined, liturgy is simply a prescribed form or set of forms and rituals for public religious worship. Among friends and family I have become the “liturgy guy” because of my love for the Mass. I claim no expertise. I have never formally studied religion, theology or liturgy. From what I can tell, however, I have studied the Catholic Mass (both it’s form and historical development) more than the average guy in the pew. I am hardly an expert on the liturgy…but I am an enthusiast! So, to come full circle, why another Catholic blog? And why blog about life, liturgy and the pursuit of holiness from a Catholic perspective? Because how we worship effects what we believe which then influences how we live. There is a uniquely Catholic way to worship. A traditional and reverent liturgy which is unabashedly Catholic, far from being optional, is actually a necessity for imparting the faith. An understanding of why we worship and how we worship helps to form us as Catholics. What we believe, from the centrality of Christ in our lives to His real presence in the Eucharist, can either be reinforced by beautiful liturgy or under cut by profane liturgy. If we fail at the first and greatest commandment to love our Lord with all our heart, soul and mind particularly with the highest form of worship that God has given the Church, then our growth in holiness will be impeded. Every few days I will be posting about life, liturgy and the pursuit of holiness. I hope you choose to follow my blog and to tell your friends about it. I also encourage you to leave your own comments. God bless! Posted on July 7, 2013, in holiness, life, liturgy and tagged Catholic, Catholic Church, Church, Eucharist, God, Liturgy, liturgy guy, Mass, Pursuit of Holiness. Bookmark the permalink. 11 Comments. Hello and welcome to the Catholic blogosphere, liturgy guy. Looking forward to reading more from you. 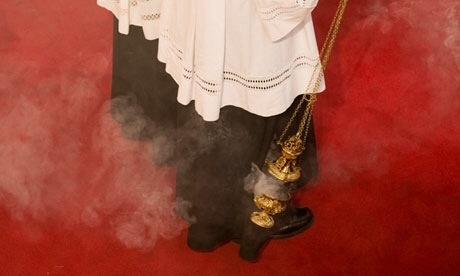 Liturgy dude, er — guy, I would love to sometime hear about your thoughts on priests, since they are so central to liturgy and worship in our Faith (duh). How do they impact worship? Oo! Is it possible they respond to the enthusiasm, love and support of the faithful, the same way a rockstar responds to his audience?.. I mean, is it appropos to make that comparison? Does drawing that sort of cultural comparison help others understand, etc. Some of the very holiest priests that I have been blessed to meet strike an amazing balance between Truth and Charity. They are the men who embrace their vocation, teach and preach the uncomfortable topics and offer the Sacraments in a visible manner worthy of the invisible Grace they impart. I do believe we nourish them too. Like a good and holy father of a family, a “domestic church”, a priest wants to see his family (his parishioners) get to heaven. Like a good father, sometimes he will praise us, some times console, and sometimes he will need to correct our behavior. When we learn and grow in holiness over time, I have to believe this serves as affirmation for them. For example, when a priest preaches Life and speaks out against the evil of Contraception for years, and then begins to see the openness to new life amongst so many of his flock, his spirit must be lifted as a father’s is when he realizes that his children were actually listening to him all those years! Finally, since this is even more a spiritual battle than a temporal struggle, prayers and mortifications need to be offered for the men in the cassocks! Rosaries need to be offered for all priests: from our Holy Father Pope Francis all the way to the newly ordained priests. Love the pictures! Have passed it on to my FB friends! Hi Liturgy Guy! I was wondering if you know of an old seminary classmate of my husbands who moved from NJ to the Charlotte diocese quite a few years ago. His name is Fr. Eric Kowalski. He came up to Toronto to concelebrate at our wedding 18 years ago. A very Good and Holy priest. Hi Teresa! Thank you for your question. Yes I do know of Fr. Kowalski. He is up in Greensboro, NC at Our Lady of Grace. I was up there on business back on Ash Wednesday and stopped in for the noon Liturgy. They get some of the young folks from UNC Greensboro at that parish due to the proximity to the school. Fr. Kowalski offers both the Extraordinary and Ordinary Forms of the Mass I believe. I have heard nothing but good things about him. What a small world! Welcome to the “blogosphere”! I see that we were both welcomed into the Church at nearly the same time: me: August 27, 2005. Hey, LiturgyGuy! I am one of Teresa B’s Facebook friends. Between 2004 and 2009 I sponsored 3 new Catholics through RCIA, and both sons through RoC. Lots of other stuff happened, too, which I am still sorting out. The Holy Spirit was certainly busy! God Bless you, your blog and your readers. Thank you Marie! Great to hear from you. It sounds like the Holy Spirit has been keeping you busy. I look forward to more of your comments in the future. Take care!